At Volyn Customs the situation remains difficult, but at a number of checkpoints the work of border guards and customs officers has been restored. In a number of checkpoints at the customs free movement by Transcarpathian and Lviv. Interfax-Ukraine reports on this subject on Monday 26 November with reference to the SFS. 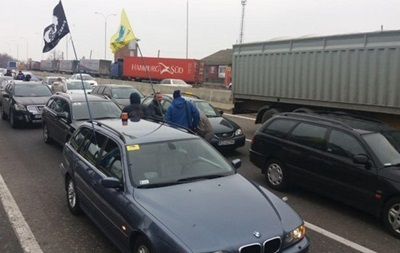 At the same time, the situation at Volyn's customs remains difficult, the demonstrators continue to block the departure from Ukraine at the checkpoints Yagodin and Ustyluh. "There are no queues in Ustylug in the direction of entry into Ukraine, at the checkpoint of Yagotin waiting 200 trucks, 20 passenger cars and 3 buses on departure," said Natalia Neprykhina, spokeswoman for the department. The Domanova checkpoint, where demonstrators blocked the pedestrian crossing in the morning, is working normally. Moreover, the point of Shegini Medica, Krakovets-Korchevaya and Rava-Ruska-Khreberne remains blocked. Unlocked traffic at the control point Ugriniv-Dolgobychuv. At the Transcarpathian customs posts Uzhgorod, Koson, Luzhanka, "Forks", Nevetlenfol operate normally, listed in the SFS. Traffic was also resumed at the Solotvino checkpoint, which was blocked until seven o'clock at night. There is no traffic at the Tisa checkpoint and the Klein Berezny customs point. It was previously known that the most acute situation is observed at the border with Poland. As mentioned, the "Euroblaster" protests almost blocked the border between Ukraine and Poland. The passage is only open at one calibration point.